Several years ago, I hopped in a cab outside the Museum of Modern Art in New York with a coworker, who pulled out his phone and showed me an interesting piece of art featuring a Coke bottle. The artist, Pakpoom Siliphan, was from Thailand. I was intrigued by the art and his approach of combining cultural and commercial icons. 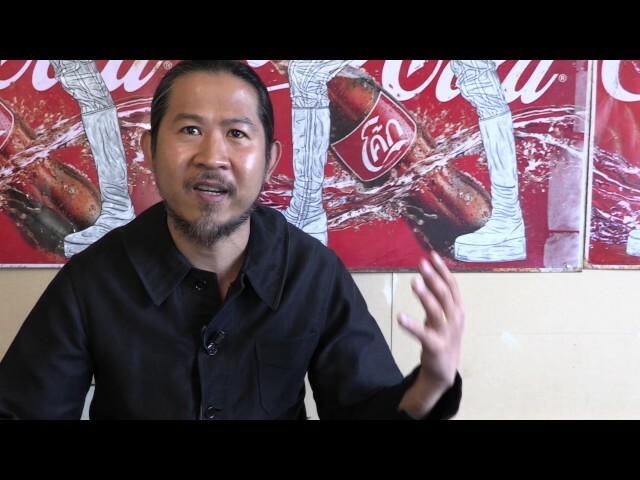 We were looking to expand our collection of pop art related to the Coca-Cola bottle for the then-upcoming 100th anniversary of the packaging icon, so when I returned to Atlanta, I began to research Pakpoom and discovered that one of his pieces, a crate of Coke bottles adorned by images of Andy Warhol, was being auctioned by Christie’s. We were able to add it to our collection. When we acquire art for our collection, we typically follow two rules. First, we always purchase anonymously. Second, the works cannot be commissioned pieces; they have to have been created organically by the artist without our influence. After adding a few more pieces of his unique artwork to our collection, I e-mailed Pakpoom, who has lived in London since finishing art school, to let him know how much I enjoyed his work and that one of his works (Ali Double Punch) would be featured on a worldwide tour that would include a stop in his home country of Thailand. I was fortunate to attend the opening of the Coke Bottle 100 show in Bangkok and made sure to invite Pakpoom’s family to the reception. Earlier this year, my colleague, Justine Fletcher, was in London to help organise the first Coca-Cola Collector Fair in Great Britain. During her trip, she made time to interview Pakpoom and tour his studio. I hope you enjoy meeting Pakpoom in this short video and learning more about his creative inspiration and process.